Annie Phenix has retired from day to day dog training as of June 2018. She is available at no charge to help you find a truly qualified, fear and force free trainer/behaviorist in your area. 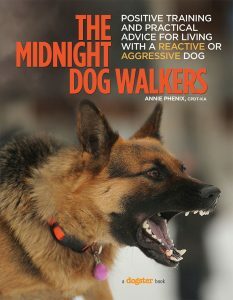 My best-selling book The Midnight Dog Walkers (Lumina Media) — nominated for a Maxwell Award by the Dog Writers of America Association — puts the power of positive dog training in your hands. Beautifully illustrated with full-color photos and filled with practical advice and real-life stories, the book is a great way to learn more about how to live successfully with an aggressive or reactive pet. Life’s too busy for dog training that doesn’t work or causes fear or harm that is guaranteed to set your dog back. That’s why I’ll listen to your concerns and goals, assess your dog, and offer practical solutions that suits your needs and fits your lifestyle. I will make sure your dog isn’t stressed, confused or harmed while in training. I want to create a dog who loves to learn! If you prefer, I will do the training for you, working with your dog in your home or anywhere you need to see his behavior improve. 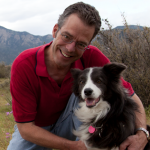 Using fear free, scientifically-backed training protocols, I reduce any undesired canine behavior issue. Owner participation and ongoing training is required of the owner — but I am here to coach you through anything! I teach you how to help your dog learn new, desired behaviors. After all, you live with your best friend 24-7 so learning how to help him makes a happy home for everyone. I work with your dog and demonstrate how to get the desired behavior and then hand the leash to you as I observe and coach you to success. Two Day Intensive Reactive Dog Seminar available for private instruction or for groups. Each seminar is tailored for your dog or group’s needs. Dog welcome! I was trained on the new sport of Nose Work by a former trainer of military explosive sniffer dogs for Lackland Air Force Base. ANY dog can do this sport and nearly ALL dogs (and owners!) love it. 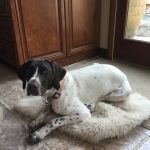 We cannot thank Annie enough for helping us with our German Shorthaired Pointer. 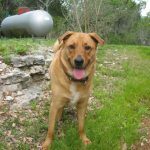 We have seen a big improvement in her ability to greet people and other dogs and be a more relax dog in our home. I wish we would have done a before and after video to share with other dog owners our positive results. Instead of a dog with anxiety we have a dog with confidence and skills to greet and meet people and other dogs. I especially want to thank you for the time you spent with Bubba and me. He has made tremendous progress and is a much happier dog. Also, if you ever need a reference, please feel free to give them my name and number. You’re the best! Thanks again for taking such good care of Sweetie! I am telling everyone I know about your great care! and I’d love to meet you and your dog. I am a CPDT-KA© (Certified Professional Dog Trainer – Knowledge Assessed) and a Certified Fear Free trainer recommended by veterinarians and clients nationwide. I am a nationally recognized behavior expert, best-selling author, national magazine columnist and a nose work instructor and competitor. 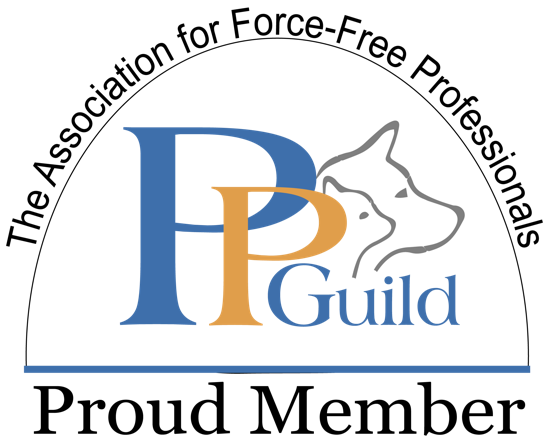 I am a member of the Pet Professional Guild and the National Association of Canine Scent Work. I have a B.A. degree from the University of Texas at Austin. 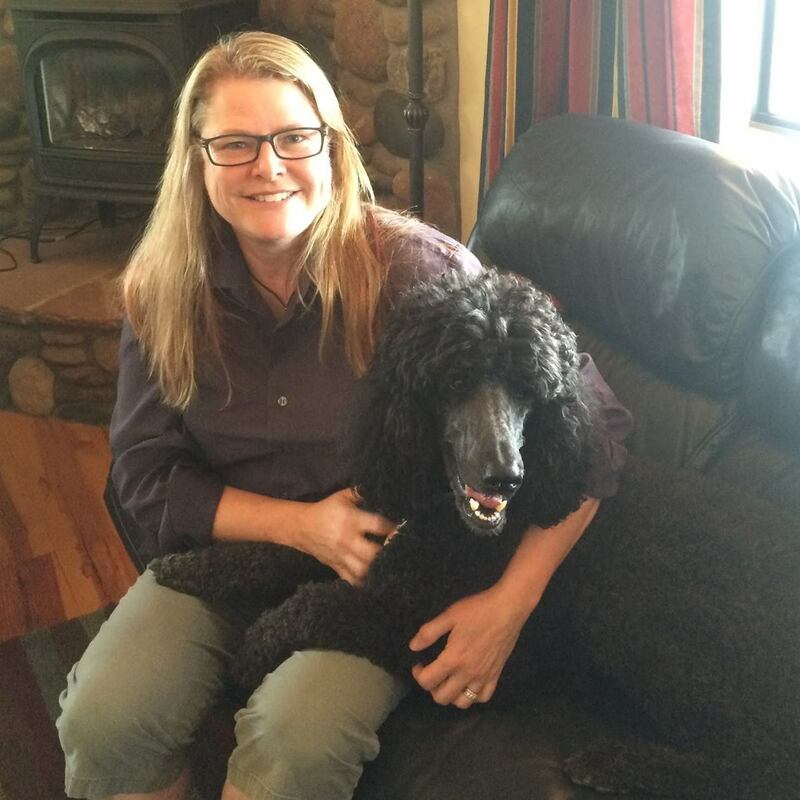 I offer Behavior Consults, Nose Work, Puppy Enrichment and Private Training in your home that is tailored to you and your dog’s needs. My Pledge to You and Your Dog: I give dogs and humans a clear communication path that allows your dog to learn to love to learn. I will never scare or harm your dog while teaching and I will find workable, win-win solutions for every canine problem. 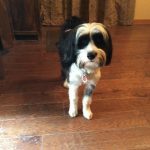 Personalized private dog and puppy training for northern Utah, including the Heber Valley, Park City and Salt Lake City.